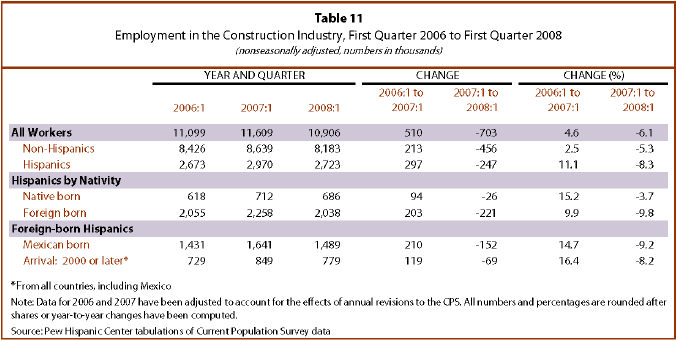 Changes in employment by industry reveal the full impact of the slump in construction in 2007. The industry was the principal source of job loss for both Hispanic and non-Hispanic workers. However, the impact was felt harder by Latinos because of their greater reliance on construction as a source of employment. The service sector—in particular, professional and other business services, health services, and hospitality services—was the main source of new jobs for all workers. Job losses in construction were the headline event for Latinos. Construction alone accounted for 54.2% of the 456,000 total jobs that were lost by Latinos across six industries. For non-Latinos, construction accounted for 39.4% of a total of 1.2 million jobs lost across a total of nine industries. The construction industry shed 703,000 workers from the first quarter of 2007 to the first quarter of 2008; 247,000 of those workers were Hispanic and 456,000 were non-Hispanic (Table 8). In percentage terms, the loss was greater for Hispanics—8.3%, compared with a 5.3% decline for non-Hispanics. 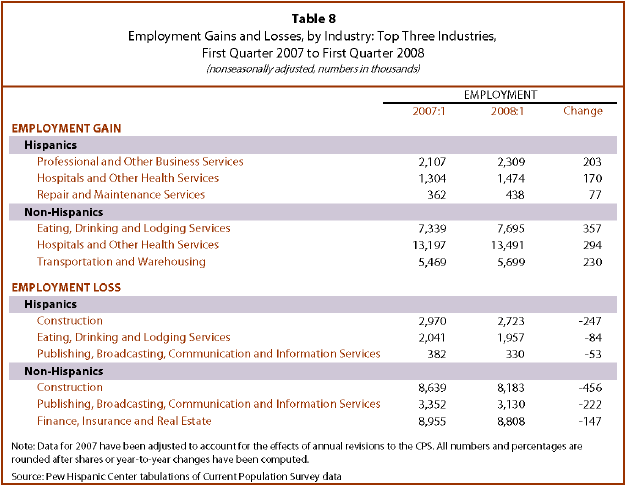 The other leading sources of job losses for Hispanics were eating, drinking and lodging services and publishing, broadcasting, communication and information services. The former is one of the major employers of Hispanics—about 2 million jobs in the first quarter of 2007. However, by the first quarter of 2008 eating, drinking and lodging services employed 84,000 fewer Latino workers. The publishing, broadcasting, communication and information services industry does not employ many Latinos—382,000 in the first quarter of 2007—but it accounted for a loss of 53,000 jobs during 2007. This industry was also the second leading cause of lost jobs for non-Hispanics as they found 222,000 fewer opportunities in the industry in 2007. Non-Hispanics also lost 147,000 jobs in the finance, insurance and real estate industry. Professional and other business services, which range from management and technical services to janitorial, landscaping and waste management services, were the main source of new jobs for Latinos in 2007. They gained 203,000 jobs in that industry. Latinos also found 170,000 new jobs in hospital and other health services.2 Repair and maintenance services also added Latino workers in 2007. The mainstay of jobs growth for non-Hispanics was the eating, drinking and lodging services industry. Notably, this industry was the second leading source of job losses for Latinos in 2007. Non-Hispanics also benefited from growth in hospital and other health services and in transportation and warehousing. Most of the jobs lost by Hispanics in the construction industry in 2007 were jobs held by immigrants. As noted above, Hispanics lost 247,000 jobs in the construction industry from the first quarter of 2007 to the first quarter of 2008. That included 221,000 immigrants, 152,000 Mexican-born workers and 69,000 immigrants who arrived in 2000 or later (Tables 9 and 10). Employment losses for Hispanics in eating, drinking and lodging services were borne by immigrant workers as well. However, job losses by Latinos in publishing, broadcasting, communication and information services fell upon native-born workers (Table 9). 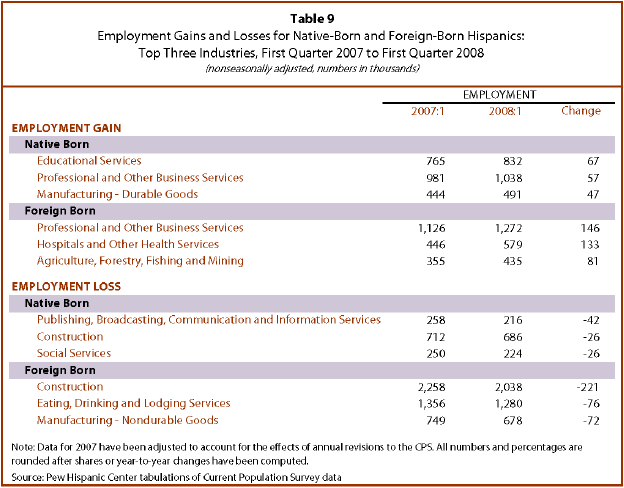 Employment gains in professional and other business services were shared by foreign-born and native-born Latinos. Among the foreign-born, most of those jobs went to immigrants from Mexico and newly arrived immigrants (Table 10). But while immigrants benefited from new jobs in hospital and other health services, most new job opportunities for native-born Latinos were in educational services. A slightly extended review of developments in the construction industry shows the full range of the downturn’s impact in 2007. In total, the construction industry eliminated more jobs in 2007 than it added in 2006. Thus, the industry employed fewer workers in the first quarter of 2008 than it did in the first quarter of 2006. The construction retrenchment in 2007 affected workers of all stripes. Hispanics gave back 247,000 of the 297,000 jobs gained in 2006. The reversal for foreign-born Latinos was complete—the 203,000 construction jobs acquired in 2006 were more than lost in 2007. 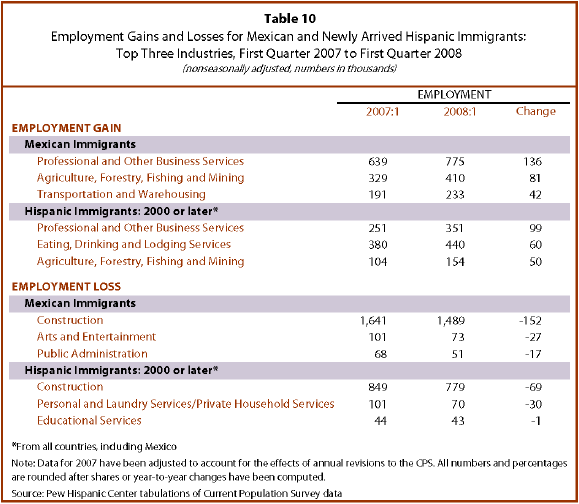 Similarly, non-Hispanics lost 456,000 jobs after gaining 213,000 jobs in 2006.